Google took one of the first stabs at the idea of smart-glasses back in 2013 with Google Glass, but the product never really took off. Now, the Amazon-backed startup North – until recently known as Thalmic Labs – is releasing their version of smart glasses with Focals. At $1000, Focals come in well under Google Glass’ introductory $1500 price-point, but will they have more success than the tech giant did? North has raised around $140 million in funding from investors including Amazon Alexa Fund, Fidelity Investments, and First Round Capital, according to the company. With these investors, North has crafted a pair of slick, custom-built glasses with a display only you can see. And when we say custom: you have to have a scan done in one of their Brooklyn or Toronto showrooms in order to even order a set. However, a trip to Brooklyn may be worth it if you’re always looking for the newest in cutting-edge technology. Reportedly, Focals keep you connected with friends and family throughout the day by giving you visual summaries (without completely obstructing your vision), displaying texts and emojis, and even a voice-to-text option. For those more interested in productivity than connect-ability, Focals also offer turn-by-turn intuitive navigation that even offers you the option of calling an Uber! Aside from other classic capabilities like calendar and weather integrations, as an Amazon-backed startup North also has a bonus feature: Focals come with Alexa built-in. Control your smart home, play music, listen to the news – all from your… glasses? 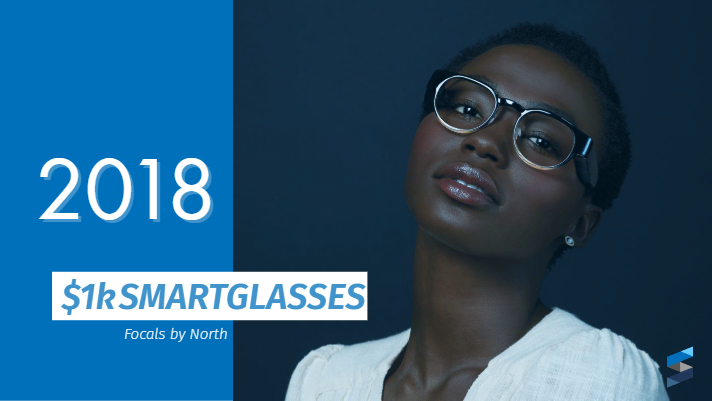 North’s Focals are definitely an interesting concept, and once the showrooms open in November 2018 and glasses start arriving during the holiday season, they’ll certainly have a product to watch. There are many new augmented reality devices coming to market over the next 6-18 months; The Magic Leap, a new hardware revision to the Microsoft Hololens, The Focal glasses. So far none have been able to penetrate the market more than garnering interest as a tech demo. We at Spitzer Tech will be interested to see if this new device can stir up more sales and adoption beyond the tech gadget community.